Heat recovery ventilation (HRV) systems allow homes to maintain high indoor air quality and low mechanical operation costs. This is achieved by keeping a physical separation between the fresh and exhaust air but allows for exchange of their thermal properties (to degree). 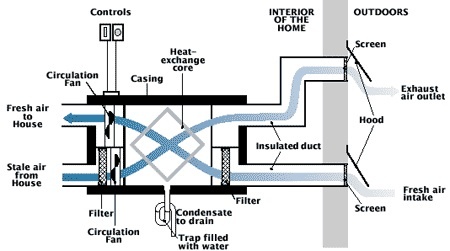 As shown in the diagram, a heat recovery ventilator consists of two separate air handling systems – one collects and exhausts stale indoor air; the other draws in outdoor air and distributes it throughout the home. At the core of an HRV is the heat transfer module. Both the exhaust and outdoor air streams pass through the module, and the heat from the exhaust air is used to preheat the outdoor air stream. Only the heat is transferred; the two air streams remain physically separate. Typically, an HRV is able to recover 70 to 80 percent of the heat from the exhaust air and transfer it to the incoming air. This dramatically reduces the energy needed to heat outdoor air to a comfortable temperature. The HRV system installed in a house can change all the air in the house over a three-hour period. Most HRVs are also equipped with automatic humidity sensors that increase the ventilation rate when needed – for instance, when you use the shower. 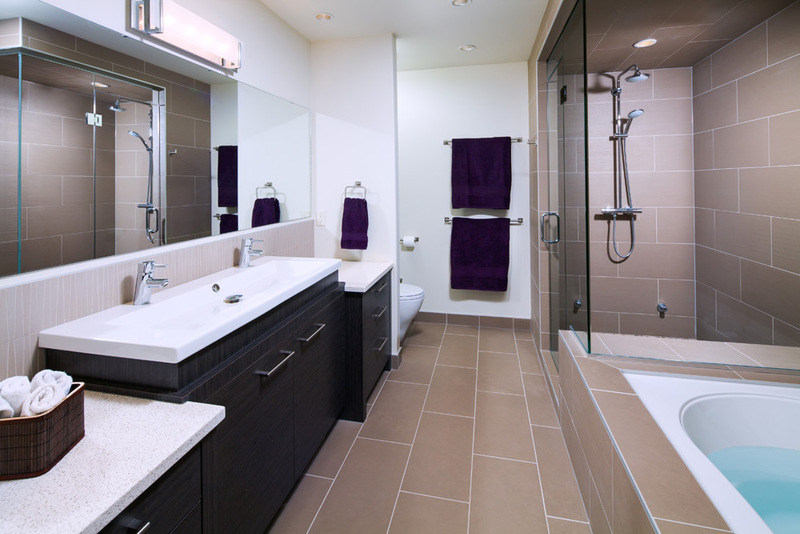 Exhaust air is normally collected from the kitchen and bathroom areas, where most moisture and odors are created. To ensure that outdoor air is supplied to all living areas in a home: for homes that have forced-air heating – the HRV is usually connected to the heating system ductwork. This requires running the furnace fan continuously to distribute outdoor air throughout the house, increasing operating costs. However, the improvement in air quality is significant. For homes that don’t have forced-air heating – the HRV is connected to a specially installed network of small diameter outdoor air ducts. Passive HRV: A passive HRV unit does not have its own internal fan and is entirely furnace assisted. It works by tying the exhaust side of the unit to the supply air plenum which forces air to exhaust from the home and at the same time fresh air enters from outside through the unit and into the cold air return duct work. Active HRV (erv): Much like the HRV the erv recovers heat (sometimes refereed to as an active HRV); however, it also recuperates the energy trapped in moisture, which greatly improves the overall recovery efficiency. In dry climates and humidified homes the erv limits the amount of moisture expelled from the home. In humid climates and air-conditioned homes, when it is more humid outside than inside, the erv limits the amount of moisture coming into the home. Both systems greatly increase occupant comfort levels and reduce overall energy costs.